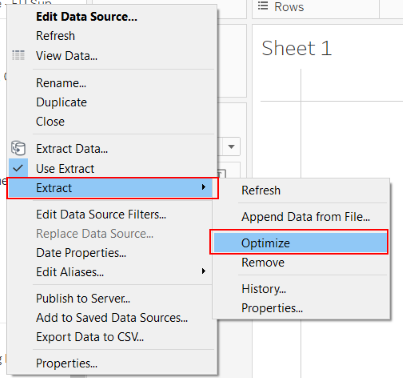 Tableau Server resource is a valuable commodity and one of the activities which use this, like no other, is the rebuilding/refreshing of Data Extracts (TDEs). At Atheon, our data (usually) refreshes each day, with many hundreds of extracts to refresh. This uses a huge amount of resource which impacts our users, where their models are likely to slow down while this process is happening (...we schedule our refreshes overnight to reduce this impact, but this is restrictive). The Backgrounder is the process which performs this task and its resource can't be limited (without buying an extra license and moving, that process, to a second machine). This means it will take as much resource as it feels necessary, at the expense of all others. However there is another way...use the SDK to rebuild the TDEs (outside Tableau) and then push the refreshed TDE to Tableau Server. In this post, I want to direct you to an open source wrapper for Tableau SDK (in Python) to create and publish TDEs (built by our resident genius Vathsala), as well as touch on a few differences when using these SDK-built TDEs, within a workbook. Vathsala has put together this post on the Tableau Community forum with information on the components (Create TDE, Publish TDE). The published library is here. We have tested this against EXAsol (in-memory database) but not much else, as we don't have a need to (currently). Initially, this library was created to support MSSQL and all the code is in place (in the library) to connect to MSSQL (but it has not been tested yet). We welcome anyone to give this a try and give us any feedback, and so contribute to making this as general purpose and stable as possible. Where do Tableau Calculations get written/stored? These calculations get written into the TDE. Again I can verify this by opening the TDE in a new workbook and see that my calculations are there (this is a new workbook, so it can't have got them from anywhere else, but the TDE). This is all very interesting, but what has it got to do with SDK created TDEs? Well, when we publish a TDE to Tableau Server, it optimises the TDE (writing the calculations to the TDE) in the publish process...and we CAN NOT (at this time) create these calculated fields (definitions) in the SDK-created TDE. So the SDK created TDE will only ever be the fields (columns) that are in the data source (original) view. and then we'd publish the workbook. Now recall that our calculations are now written into the (server-side) TDE, and not (necessarily*) the workbook. So this means if we use our SDK to rebuild this data source and publish it over the version we (previously) published, the workbook will break. The workbook is relying on the TDE to tell it how to compute any calculated fields and the (server-side-SDK-created) TDE no longer has that information. So what we need to do is create the TDE using the SDK, and get the SDK to publish the TDE to Tableau Server. We then connect our (fresh/empty) workbook to the server-side-SDK-created TDE, than start developing...adding in any calculations (as we would do normally). As we can't write to a server-side data source,any calculations we create are written into the workbook (this why when you try to edit a calculation from a server-side TDE you only get the Edit Copy option...it's writing a copy into the workbook). Once our workbook is ready, we publish the workbook to Tableau Server. Now, when we rebuild the TDE (using the SDK) and publish (over the old) TDE, the workbook won't break as it now only needs the TDE for the raw data (and not the calculation definitions). It's important to note here that we are copying over the previous TDE (same name and location). The SDK isn't doing anything to the workbook. This means when the workbook is opened, it is none-the-wiser that the TDE is actually a refreshed/rebuilt version. It looks for the TDE (with that name in that location) to get the data, and finds it. This is akin to how a Live connection works (but the data source is the TDE)...The calculated field instructions are in the workbook, referencing the raw data from the Live view/table. The advantages over just using a direct live connection is that TDEs are (generally) faster than most (non-column-store) databases, it has access to all Tableau's functions (eg DATEPARSE), and the database isn't constantly being hit with queries (generated from Tableau as users use the workbook)...big shout-out to my friend (and Server guru) Toby Erkson for helping come up with the Live analogy! it doesn't matter where it sits (TDE or workbook), as it always has to be run on the fly...as the VizLoD (viz Level of Detail) control how it's calculated (if that doesn't make sense, read this), whereas the result of each row level calculation is the same regardless of the VizLoD, filtering...etc. So the final work flow is...create the TDE (locally) do some experimental development, so we know which fields we'll want to be materialised, ask our DBA (nicely!) if they'll add these to the view definition...get the SDK to create the TDE from this view, and publish it to the server. We then connect to the server-side-SDK-created TDE (from Tableau Desktop), then develop the final model and publish. Hope people find this useful, and can free their server resource to allow Tableau Server to do what it does best...process data queries and return the results in beautiful renderings! Please give it try and any feedback is always welcome.